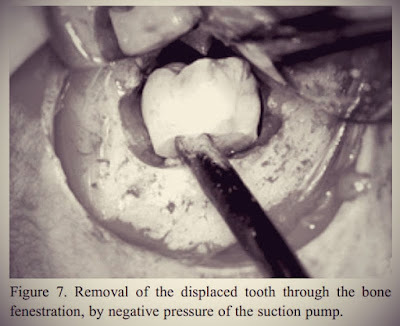 An unusual case of an impacted right maxillary third molar that was accidentally displaced into the maxillary sinus during exodontia and was surgically retrieved almost 2 years later is described. The tooth was removed under general anesthesia, after maxillary sinus exposure through Caldwell-Luc approach. Postoperative recovery was uneventful. Six months after the retrieval surgery, the maxillary sinus was completely healed and the patient did not present any complaint. Removal of impacted maxillary third molars is a common surgical procedure performed by oral surgeons and dentists alike. As expected with any surgical intervention, accidents may occur during exodontia, such as tooth displacement into the maxillary sinus. Although this type of accident has often been mentioned in oral surgery textbooks, very few cases have been reported in the literature.